This Easy Shakshuka with Chickpeas is the vegetarian go-to breakfast recipe to make during the festive season! Loaded with energy-packed ingredients and naturally gluten-free, this one-pot egg recipe is totally easy to make in less than 30 mins. When it comes to the day after a fun night out, a super easy shakshuka is the sort of breakfast that gets you out of bed. It’s a popular energetic Middle Eastern breakfast egg dish to share, served directly from its hot skillet. Despite the curious name, shakshuka is basically a dish featuring poached eggs in tomato sauce ( a bit similar to the Italian Eggs in Purgatory), and it’s also incredibly easy to prepare, with simple pantry staples and a couple of fresh ingredients. 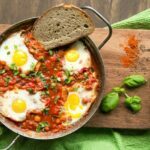 This nutrient-packed easy shakshuka makes a well balanced breakfast/brunch/lunch/dinner meal in as little as 25 minutes. 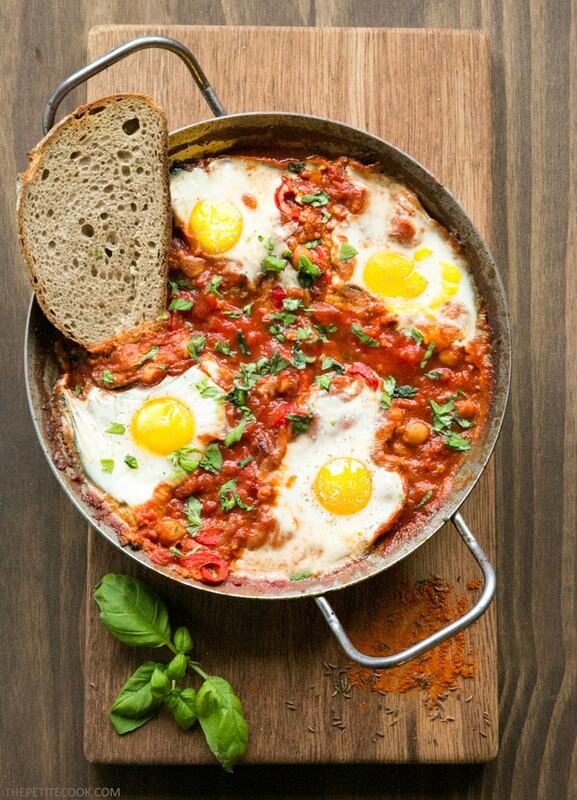 The fiery and spicy tomato and bell pepper sauce with a added chickpeas, is the perfect base for free-range eggs baked to perfection and crusty bread to soak up all the flavorful sauce. 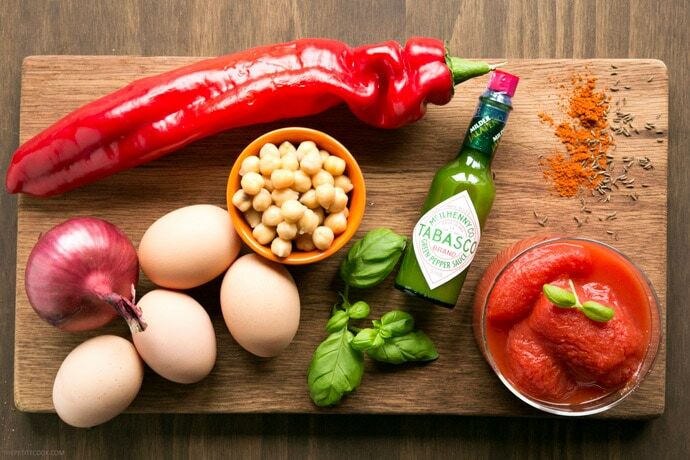 Ready in less than 30 minutes, all you need to make this easy shakshuka with chickpeas is just a handful of everyday ingredients: bell pepper,onion, garlic, eggs, chickpeas, whole canned tomatoes, basil leaves and a pinch of cumin and paprika. For an extra spicy punch, I’ve added some Tabasco Green Sauce in the mix, which goes especially well with this easy shashuka, and it’s just a little bit milder than the classic Tabasco Sauce. It gives this breakfast dish a nice spicy kick without overwhelming and overpowering the other ingredients. I’m a massive fan of spicy ingredients and the way they easily bring any dish to the next level. So for this recipe I’ve teamed up with Tabasco and joined their Festive Survival Squad this holiday season, to create a recipe that works wonders for the morning after the night before. 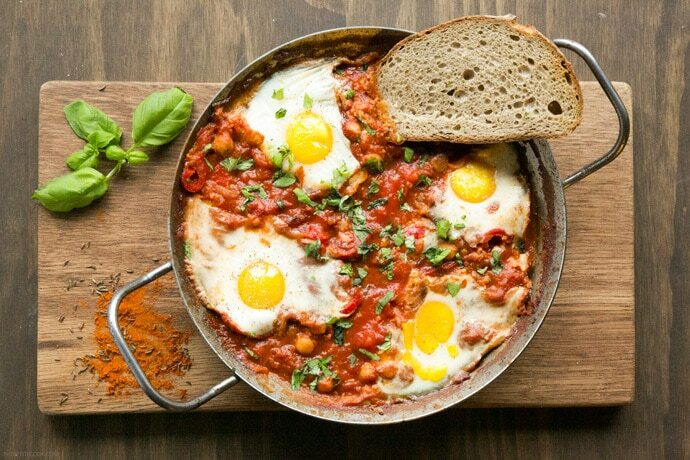 This Spicy Chickpea Easy Shakshuka is packed with nutrients and works wonders as a breakfast after partying all night. 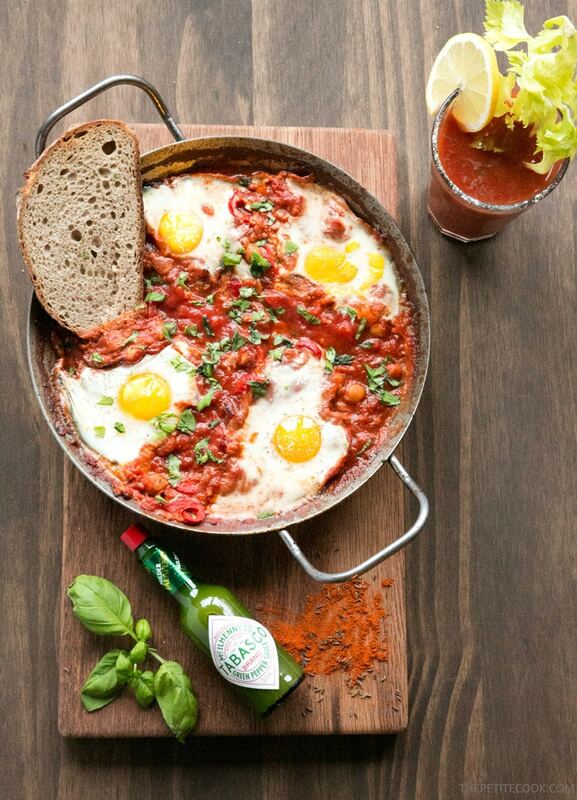 Whether it’s a regular weekend morning, Christmas day or even better the day after New Year’s Eve, this easy shakshuka will surely cure any hangover – And if you don’t have any, it’s just a great excuse to splash everything down with a good Bloody Mary! This hearty and robust easy shakshuka is definitely my go-to brekkie after a fun night out – What’s your favorite “the day after the night before” breakfast recipes? Hit me with all your favourite recipes, I can’t wait to hear your ideas! Preheat the oven to 180C/ 356F. Transfer the tomatoes to a large bowl and squeeze through your fingers to create a chunky purée. Set aside until ready to use. Heat a large oven-proof skillet over medium heat with the olive oil, then fold in red onion and chopped bell pepper, and cook without stirring for 4-5 min, until softened and gently browned. Add garlic, paprika and cumin and cook, stirring, until fragrant, about 30 seconds. Fold in the tomatoes and stir to combine. Reduce heat to a gentle simmer and cook for about 8 minutes, adding chickpeas half-way through cooking time. If the mixture gets to dry, pour in some of the tomato juice reserved from the can, then season to taste with salt and pepper, and stir in a couple of fresh basil leaves. With the help of a spoon, make a well near the edge of the pan and break an egg directly into it. Repeat with the remaining eggs, then season them with salt and pepper to taste. Transfer the pan to the oven in the middle rack and cook for about 6-8 min, until the eggs are cooked through and the yolks are still runny. Remove from the oven, sprinkle with a handful basil leaves on top and serve straight away with crusty bread on the side.